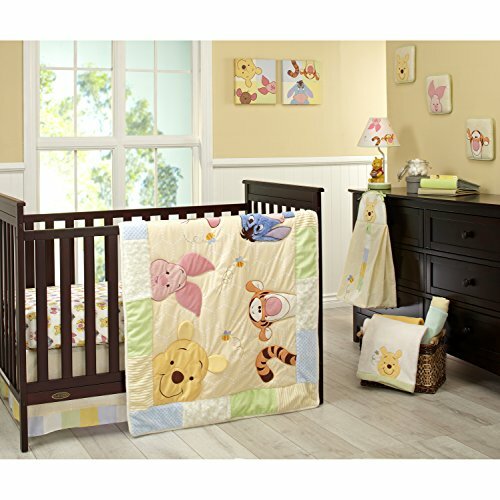 Winnie the Pooh First Best Friend 4 Piece Nursery Crib Bedding Set. Surround your baby with very first friends Pooh Bear, Tigger, and Piglet with the Disney Baby Winnie the Pooh First Best Friends Aqua, Red, Yellow, and blue 4 Piece Crib Bedding Set. This sweet set includes a double-sided grey and white striped comforter featuring Pooh Bear floating beneath a red balloon saying "Sometimes the smallest things take up the most room in your heart" on one side and a pattern of Pooh, Tigger, Piglet, and colorful balloons on the other; a coordinating patterned fitted sheet; a dust ruffle featuring sweet stripes, colorful polka dots, and blue checks; and an adorable keepsake box featuring the friends dipping into a jar of 'hunny' on the lid. Coordinates with a full line of Winnie the Pooh First Best Friends nursery decor and accessories. 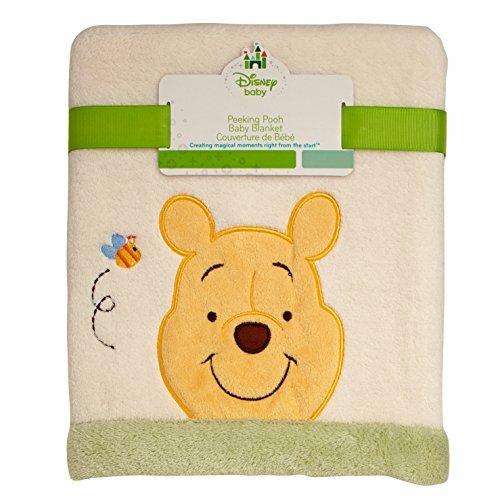 Disney Baby - Peeking Pooh - 7-Piece Crib Bedding Set Includes: 1 Comforter, 2 Crib Sheets (1 multi print & 1 solid sage), 1 Dust Ruffle, 3 Soft Wall Hangings. Peek-a-boo peeking Pooh. This fun and playful group features Winnie the Pooh, Piglet, Eeyore, Tigger and little Roo all in a game of peek-a-boo. Beautifully crafted in a mix of textured plush & velboa fabrics in gentle shades of ivory, butter, blue, sage, pink, and orange. Coordinates with a full line of Peeking Pooh accessories & room decor. Winnie the Pooh - First Best Friends 2 Pack Fitted Crib Sheets. 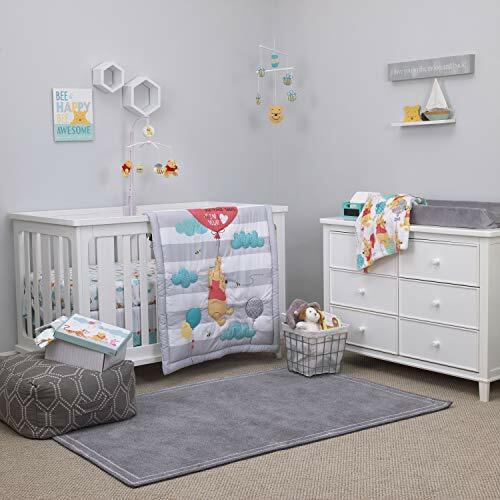 Complete your Winnie the Pooh themed nursery with the Disney Baby Winnie the Pooh First Best Friends White, Aqua, Gold, and Red 2 Pack Character Crib Sheets! Set includes one white fitted sheet printed with Pooh Bear and his friends Tigger and Piglet playing amongst colorful balloons and one aqua and white plaid fitted sheet. Sheets fit a standard size crib mattress 28" x 52". Coordinates with the complete collection of Winnie the Pooh First Best Friends nursery bedding and decor. 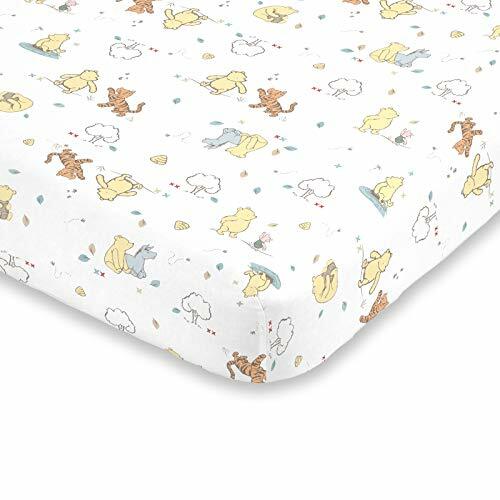 Classic Pooh - Fitted Crib Sheet. Your little one will sleep sweetly surrounded by Disney Baby's beloved Classic Winnie the Pooh characters in shades of ivory, butter, aqua and orange. This 100% cotton fitted crib sheet features Winnie the Pooh, Tigger, Piglet and Eeyore on the sides, front and back. Made to fit standard size crib mattresses, with elastic all the way around for a snug fit. 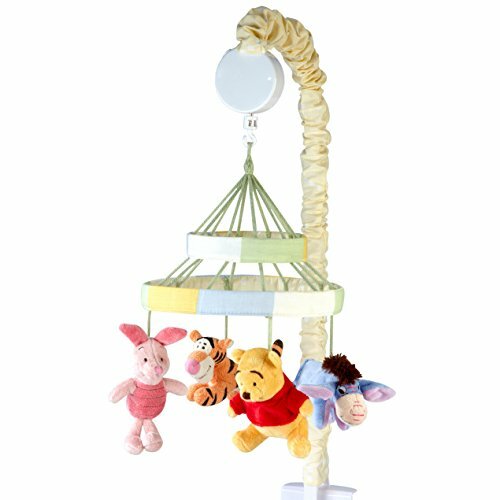 Winnie the Pooh First Best Friend Secure-Me Crib Liner. 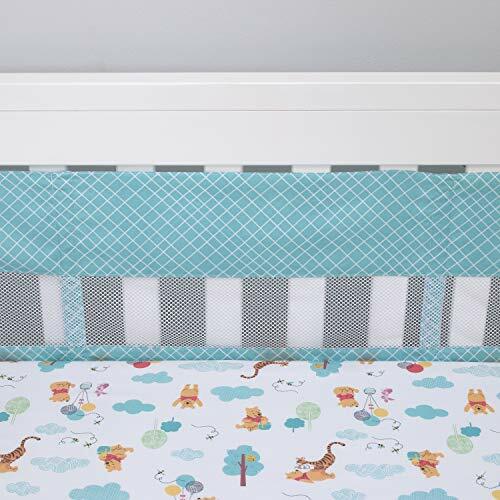 Sky's the limit with the Disney Baby Winnie the Pooh First Best Friends Aqua and White Secure-Me Crib Liner! This easy to Install, four piece design helps keep arms and legs safe inside crib slats. No more dropped or lost pacifiers and other items! Plus, mesh design keeps baby cooler in warmer temperatures. Flexible design fits most standard and convertible cribs. Featuring a sketched white plaid print on an aqua background with aqua corner ties, this liner is made of 2 long and 2 short side segments. Coordinates with the full line of Winnie the Pooh First Best Friends nursery bedding and decor. The 3-Piece crib bedding set includes one quilt, one fitted crib sheet and one crib skirt. The quilt features a charming hillside in shades of blues and grays with Winnie the Pooh, back to back with his best friend Piglet. Under the starry night sky, they amuse themselves blowing dandelion flowers into the night air. Winnie the Pooh is fully appliqued in a soft Sherpa and is wearing his favorite blue chambray shirt. Tigger, sitting close by on the hillside is enjoying the view. 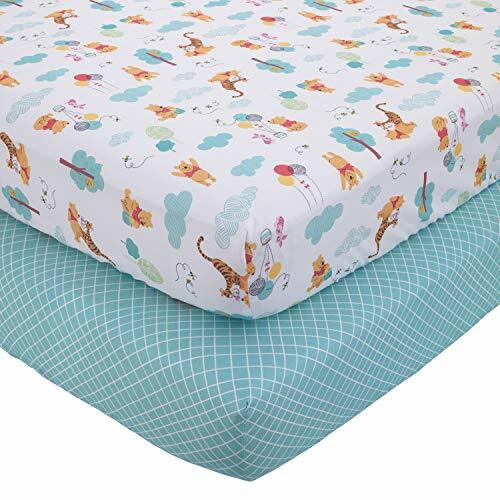 The fitted crib sheet is decorated with various trees in different shapes and sizes along with silhouettes of Winnie the Pooh and moons and stars. The crib skirt is a pattern of two colors of blue. This collection has been digitally printed in a high resolution which enhances the blues and grays and it is eco-friendly. Classic Pooh - Fitted Mini Sheet. This 100% cotton fitted crib sheet is cozy and cute. The classic design is the perfect complement to a baby's Winnie the Pooh-themed nursery. Made to fit mini crib mattresses, with elastic all the way around for a snug fit. Features Winnie the Pooh, Tigger, Piglet and Eeyore in shades of ivory, tan, aqua, butter and orange. Disney Baby - Peeking Pooh - Baby Blanket with applique. Soft creamy ivory velboa blanket accented with a sage bordered edge, appliqued with happy smiling Winnie the Pooh peeking over the edge. Detailed with embroidered bumble bee buzzing by. Blanket measures 30" x 40" and is made of 100% polyester. Makes a perfect keepsake gift and coordinates with a full line of nursery bedding. Shopping Results for "Winnie The Pooh Baby Cribs"